It doesn't proc at 46. This dropped last night off the sea serpent thing. one of our bards got it. While this is a great rogue weapon i would much rather prefer a flame etched short sword (12/17 25 ac 10 sv magic and fire)in my primary hand and a primal in my offhand (13/20 5 all stats, 10 ac, 50 hp/mana) and a windraiders belt for haste. nonetheless this is an awesome weapon.period. I looted this last night. It is definitely a 14/22 weapon now as the graphic shows. #Wendail, Posted: Mar 04 2002 at 3:17 PM, Rating: Sub-Default, (Expand Post) Is this item a 14/22 or 14/24. If it is indeed a 14/22 ill send a letter to the people about it. Oh, and mine is also 13/29, which was very good back then, but the name and proc are the same. This item actually use to drop off Phingel Autropus(sp?) long ago before Kunark came out. How do I know? my dwarf rogue has one and I haven't played him for almost two years. Mine however doesn't have the stats. Not that any of you care but I found it interesting they buffed it up a bit and stuck it in ToV. It's a good taunter and a solo-er's dream. I use this weapon on my rogue mainhand with RB offhand. It does about the same dmg for BSing as ragebringer but more dps in the mainhand overall. Its 14 22 now btw. Procs? with only 190 dex it still procs a ton. I often get as many as 3 to 5 procs per mob if im buffed right. The bad side is, if evade fails im usually toast because the slow effect causes some serious agro. Is this and RB the best combo for a rogue? Sorry but its far from the best combo. Id rather have Mylokar's, or Zephira's dagger of blood, paired with Primal spear while using one of the uber haste items such as GoDS, Windraiders belt, cord of velocity, ect. Come to think of it, Primal mainhand and the trident offhand would be awesome too, but I prefer the resists of the other weapons I listed since I play on a pvp server. I'm not interrested in who should be able to use this. I'd like some facts, like what drops it per chance? Thanks BE to holy monkey for asking a pertinant question, and to raravis for giving an easily understood answer. #Dakken, Posted: Jul 22 2001 at 10:37 PM, Rating: Sub-Default, (Expand Post) who the hell uses a lance without a horse? On a side note, the concept of 'blunt weapons for priestly peeps only' in D&D and similar RPGs had absolutely *NOTHING* to do with 'less violent' weaponry. It had to do with blunt weapons being more effective against skeletal undead, which back in the day were among the most common enemies in a D&D campaign. The clerics were assumed not to have time to learn every weapon style, and thus blunt weapons were the easiest to figure out. It was a matter of pragmatism, not what weapons draw blood. It's as bastardized a concept as when Squaresoft US changed the blade to a giant iron ball that was supposed to fall on Rosa in FF IV for a 'more sensitive' American audience in the translation. Believe me, a mace is going to kill someone just like a sword. Check out Braveheart for some rather accurate depictions of what happens when blunt objects meet human beings in combat. There is, however, merit in the concept that paladins (and clerics) should have their weaponry choices based upon their faith... that *would* have been a cool idea... one now put into D&D 3rd Edition. Actually priests using blunt weapons is a reference to our own history. There is a passage in the bible which forbids the spilling of another man's blood. (Not thou shalt not kill...but that applies as well ;) Anyway, several religious orders of knights adopted maces since the killing blows did more internal damage then and there was therefore less blood and they could attempt to follow the literal letter of the law if not the spirit of it. It should be paladin erudite prexus *sp? * only. 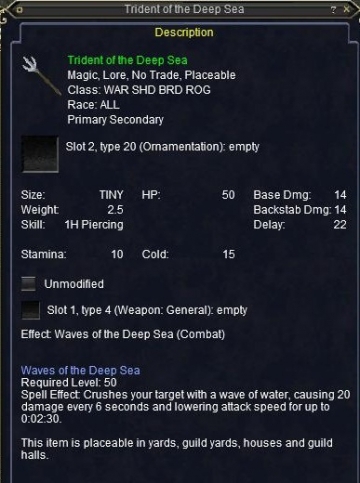 I mean come on they are about the only ones that follow the ocean lord and the name of it and effect screems his name =\ Then again what do I know. That would be all fine and dandy, but how many friggin Erudian paladins are there? They'd have to make it droppable like the Shield of Stalwart Seas from Hate, just cause there's never Erudian Paladin when you need one, let alone one that follows Prexus. I've mentioned this before, and people have used the arguement about "Paladins should only use Lances... which are 2-handed weapons." There is NO time that someone will use a Lance and not be using a Shield. Lances are 1-handed weapons, despite what Verant thinks. Lances are certainly 2 handed weapons. If your thinking classicly using a lance for jousting then yes its a one hander powered by a running steed. Trying to use a lance one handed would be like trying to weild a large wet mop. Sure, you could swing hard but your accuracy and speed of repition would leave something to be desired. This weapon isn't all that great for anyone but rogues, this in secondary and Ragebringer in primary would completely blow other combos away. 14 dmg and 15 dmg weapons for rogues, throw in the backstab damage, and you have yourself a human (or half elf, or dark elf, halfling, etc :P) blender. Also concerning Mrylokar's Dagger... it's not that good anymore, 11 dmg for a rogue isn't all that great, though it would make a decent primary if the rogue would rather go for speed instead of raw damage and a fast weapon like Crescent Blades of Luclin or Willsapper in secondary. OMFG.... 14dmg 24dly AND 500dmg DOT AND 10%target slow? I think all of you have it wrong. After the group find this baby on the mobs body... there is only 1 person this should go to. Not any rogue/warrior/bard/shadowknight in particular, but the one with the highest dex and the one who has a weapon worse than this (which is quite alot of weapons!). No matter who this goes to, 14/24 with a additional 20dmg per tic for 25 tics is hella!! This IS good for a rogue you "n00b"
And I play a 50+ rogue so don't tell me crap how rogues manage their agro. But yes I agree a primary tank would use this better in prim hand because there are other rogue weapons just as nice out there for offhand. i do not see myself using this weapon. #AngelsynWhitewings, Posted: Jul 11 2001 at 6:32 PM, Rating: Sub-Default, (Expand Post) Why does Verant insist that Paladins not be able to get the high-end 1h-Piercing weapons? Also keep in mind that Verant ahem, "borrowed" ideas from other RPGs (IE D&D) that Paladains have limits on their weapons, due to their mythos. Blades are permitted as holy knights of their church, but the lance really is the only peircing weapon I can imagine them using and then, only from horseback. (They are entertaining the idea of mounts in the Luclin expansion.) Just consider it a ballance for getting spells and a LoH. Angel...there are maybe 3-4 one-handed piercing weapons that Paladins can use, and they are all under lvl 20 (or so). That's because Paladins were never meant to be piercers....the addition of the lance-style two-handed piercers is quite nice...and I think very RP'able (love making up words), but wasn't necessary (IMO). I would expect to NEVER (and that's not a word to be used lightly) see a high-end one-handed piercer for a Paladin. If one does show-up, it will be sooo difficult to get (something like the ultra rare drop on Kerafyrm(sp?)) that maybe one Paladin will ever get it. Yknow, they did make a lot of 1 handed weapons for the paladin and the shadowknight that are very good,as a kind of reward for not getting dual wield. Paladins dont really strike me as the spear type for the most part anyway. Spears and impaling type weapons are definately not very Paladin like. If anyone was to ever think of a Paladin as being in character, he/she would be wielding either a large two handed blade or a lighter 1 handed sword with a shield. Other possible weapons for a Paladin would be a ball and chain, mace or morning star. Paladins are supposed to be the knights of honor, who fight in honorable combat, not by hitting their opponent with ranged weapons and spears are too flimsy for the rathe of true battle. Oh, and can't forget the dorfs... no respectable dorf would be found without his trusty battleaxe somewhere nearby. because, Paladins aren't meant to be a piercing class. No big deal, man. I am very curious as to the effect of this thing. Could you please submit the proc information when posting these items? I am on CT, so maybe I will axe Clug what it do. Heres the proc, pretty awesome indeed. No this actually isn't a good weapon for Rogue, just like willsapper isn't a good weapon for Rogue either, Why? all you n00bs ask, is because a high lvl rogue with double-bs already has enough problems managing aggro, slow procs are bad news for rogues..... these types of weapons should goto primary tanks to help build up their aggro. Actually, weapon procs had their aggro factor reduced to almost nil a couple of patches ago. So proc away. #Anonymous, Posted: Jul 11 2001 at 10:14 PM, Rating: Sub-Default, (Expand Post) hehe.. BULLS*!&@ this is AWESOME for anyone that can use it.. i mean look at the thing! 14dmg 24dly! 500 point dot as a proc! .. in my personal opion this ROX!